Watch as Mark Bjorklund pilots for the first time, the twin engine Ducati that he built himself. 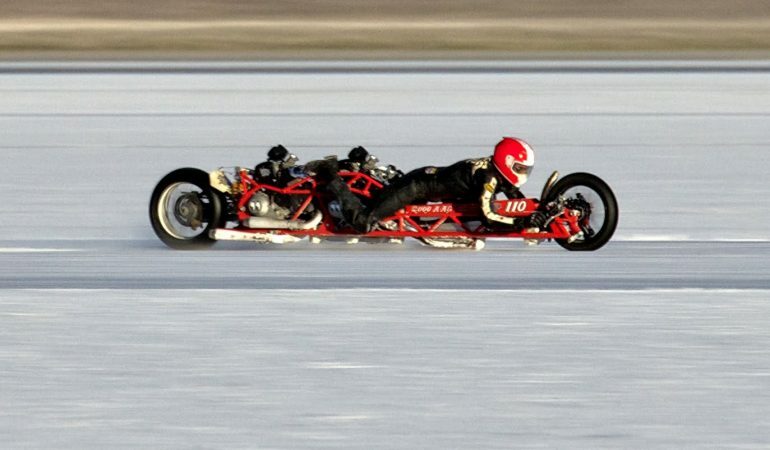 He rides laying down, facing forward, inches above the salt at speeds approaching 200 MPH. He says it is an extremely difficult bike to ride and you tell why just by looking at this contraption, however, I think it would still be pretty to ride once or twice. If you want to learn more about Mark Bjorklund and his Bonneville ventures, he was featured in the motorcycle movie “Out of Nothing”.